This set has been in currency since 1994 (there is another of the Vermeulen chamber music CV39-41) . It is a monument not only to Vermeulen's music but also to the great work of the Donemus Foundation, the Vermeulen Estate and the enlightened support of the Nederlands Government. The Apennine spine of the set is the septet of symphonies running 1912-1965. All but No 5 are in a single movement; the fifth is in three. In the foothills are three extracts from his own The Flying Dutchman (1930) and the song for soprano and orchestra La Veille (1917 arr 1932). The recordings are from Dutch Radio. Some, though not all, may be familiar from LP issues. They date between 1977 and 1984 with one of The Flying Dutchman pieces from 1994. Vermeulen was the classic outsider. Gifted both as a composer and as an author, he did not pull his punches with the musical establishment of Holland and he quickly alienated Willem Mengelberg and the management of the Concertgebouw. His character was perhaps rather akin to that of British composers Joseph Holbrooke and Havergal Brian, both doughty critic-authors as well as individualistic and ambitious musicians. Paul Rapoport's book Opus Est grouped Vermeulen with Brian, Pettersson and Holmboe amongst others. Vermeulens self-imposed exile in France was to last twenty five years and left its legacy in the French titles of seven of the nine scores here. The music except in the first symphony and the Flying Dutchman music is complex and in the words of Otto Ketting polymelodic. It has more in common with Pettersson and Brian than with Holmboe. I would also mention Karl Amadeus Hartmann as another reference point although Vermeulen's building block tunes seem simpler than Hartmann's. A symphony of songs indeed. It starts with a memorably heroic brass fanfare (which reappears momentarily at the end) and passes through great washes of string sound in character with the Vaughan Williams symphonies 4-6. The more heroic moments could have served as a pattern for Miklós Rózsa's and John Williams' film music. There are also extensive rural passages all of which sound more Scandinavian than Germanic although there is a flavour of Mahler in the martial elements. Incredibly, given the high-riding confidence of the piece, this was Vermeulen's first work of any type. It is a sunny work, bursting with pre-Great War idealism and reaches across several borders to shake hands with equally happy works such as Peterson-Berger's second symphony. The first decent performance had to wait fifty years until Bernard Haitink and the Concertgebouw introduced the work to Amsterdam. Why does Haitink not play the work now? The great divide of the 1914-18 war separates this from its predecessor. It is a prelude to a new day - yes - but that day is one marked by waking nightmares and only the vaguest tatters and shreds of hope for the future. A side drum clatters over a funereal and minatory theme. This must have been a concert performance complete with close range cough (from the conductor?). The last ten minutes chart increasingly raucous bugle call and alla marcia territory. The music is rather Stravinskian at times like the chillier reaches of Petrushka and Le Sacre. Kersjes may well be known to dedicated tape and British music collectors for his 1980s performance with the same orchestra of Bernard van Dieren's Chinese Symphony. This prologue was written for an outdoor spectacular to words by Martinus Nijhoff complete with Philips amplification. The style is marginally more relaxed - less aggressive - than the second and third symphonies. Vermeulen is fond of insistent heartbeat drum ostinati and these he uses with a string theme, predicting Bernard Herrmann, to create a pessimistic atmosphere which is transformed into an almost Brahmsian calm. A quiet raindrop ostinato on harp provides a gentle motive force like a similar long-sustained figure in Bax's Spring Fire symphony or in Sibelius' Nightride and Sunrise. The style is Debussyan. Over it erupt various brass figures sometimes jaunty, sometimes threatening, sometimes heroic. The music becomes increasingly "gothick" as befits its subject but moves into a resplendently triumphant march-like hymn. This would make an excellent accessible introduction to Vermeulen's work. This staid monastic reflection accompanies the Easter festivities of Boniface. This is not a distant stone throw from Hovhaness and Arvo Part's Cantus. An exhausted plodding off-beat pizzicato trudge launches this scena to words by Francois Porché (1877-1944). The song was written in 1917 and later arranged for orchestra during Vermeulen's long stay in France. This is the equivalent of Housman's "soldiers marching ... all to die." and of course it was written during the height of World War 1. The style is again impressionistic rising to some martial fury and fierce resentment at 6:30-7:10. This and its successor are war symphonies with No 4 written in the wake of Hitler's blitzkrieg conquest of France. Droning and an inexorable drum-beat launch the work which is strident and discordant as various themes and figures march independently in a maze and from time to time a tempest of sound. Simplicity surfaces periodically (e.g. at 4:00, 16:30) but soon the thickets of sound arise again. The victories in question are the many (wished for) victories which were needed for the Allies to secure the ultimate victory over fascism. Straightforwardly victorious themes are not in evidence at all. The victories are tortuous and painful - not at all joyous - although the high-screeching strings achieve something close to athletic elation after 19:38 and a Roy Harris like ecstasy floats high (21:10). In the closing bars Vermeulen affirms all that has gone before with a clamantly desperate air of triumph. This is his largest work and is unique among the symphonies in being in three movements. The title is from a farewell letter written by a leader of the French Resistance after his torture and prior to his being led to a firing squad. The sentiment of a singing, blessedly happy future is familiar from idealistic works such as John Ireland's These Things Shall Be. Vermeulen is not given to easy singing or at least not after the 1930s. The first movements surging, torrential and strident lines lighten only intermittently to open windows on more peaceful landscapes (e.g. CV 37 track 5 - 4:36, 7:03) but soon the monsoon of rippling rushing themes sweeps everything aside. The second movement opens in very welcome calm with a gently intoned saxophone solo around which other instruments interlace. Soon however Vermeulen's insistence on complexity comes to the fore. The final movement presses forward in much the same way with prominence given to long tunes. The complexity of this music can be oppressive as well as impressive. Its tragic demeanour is both universal and overpoweringly personal: His first wife had died in 1944 and one of his sons was killed resisting the Nazi invasion early in the 1940s. Vermeulen set himself the most exalted of aims. Whether he achieved them through this symphony and its predecessor I rather doubt. In any event once he had completed the symphony he abandoned the writing of music for ten years. This work was written after the ten year silence. He had returned to Holland and music criticism after the War. The same decade introduced him to an avalanche of music he had not been able to hear during his twenty year seclusion in France. The symphony was premiered in 1960 and its dedication is to the composer's second wife: Thea Diepenbrock. The title is lifted from Baudelaire's poem Le Balcon. Vermeulen employs a La-do-re (l'adoré) figure to denote the adored or beloved in life. The music has the same complexity we are now used to from the earlier works. Dark dreams float before us. The saxophone is prominent in the less noisy textures - serenading and meditating. Simplicity asserts itself occasionally - usually in the quieter sections (Track 3 18:55, 20:40). A fondness for marches (purposeful and savage) is clear enough. They often emerge out of quiet and disrupt its peace. Melody is there but obscure and often twisted out of shape. Sometimes it emerges gloriously in full flood as in 24:02 and closes the work in a not unclouded confidence. 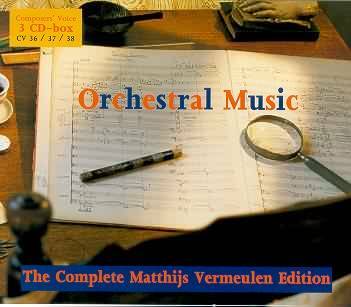 Symphony No 7 Dithyrambes pour les temps à venir (1963-65) 18:02 Omroep Orch and Radio Chamber Orch/Roelof van Driesten rec 1984. This, the shortest of the seven, was premiered in Amsterdam in 1967, the year of the composer's death, and is intended as a song of joy. He was by the time of the premiere quite deaf. The music was written after a decade of his retirement to Laren, a period during which he was at last able to dedicate himself to music. The music sometimes sounds like a giant clock mechanism. The times to come envisioned here, feared or invoked, are disturbed. The visions are out of a Bosch painting. Only in the final "sunrise" bars does a sense of conventional joy emerge. Recording quality is exceptional. If you are dubious try the first symphony. The discs are well filled: 74:20, 73:54, 74:37. The only forced compromise involves splitting the fifth symphony across CDs 2 and 3. However all credit to Donemus for presenting the works in chronological order across only three discs. Some low level tape hiss is discernible in some of the recordings especially when listening with headphones. This does not detract from the music.